April showers do indeed bring May flowers. Some days are hot. Some days are cold. 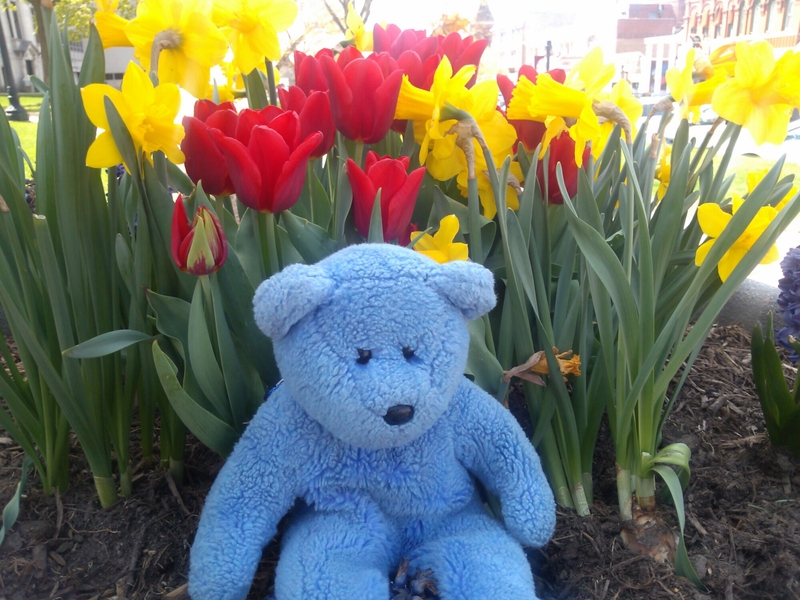 But one thing is for sure, spring has sprung. I am not sure where this quote came from. Something similar is attributed to Terry Tempest Williams in Refuge and there is also a similar line in a Seekers song. You decide. I just like the thought and have been waiting for a day when I could use it. Today is the day. For this day there are flower birds flying from my house to yours. 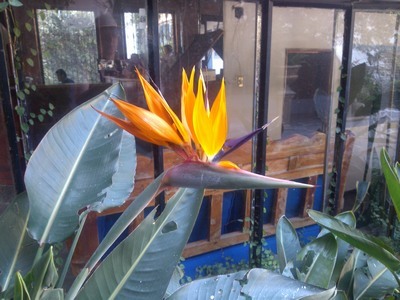 Bird of Paradise. Aptly named, don’t you think? Reminds me of a crane. The beauty of creation never ceases to delight and amaze me. Looks a little like Audrey II, the man-eating plant in Little Shop of Horrors, don’t you think? This flower bud, which is probably 8 or more inches long, opens, petal by petal, exposing a ring of long, tubular yellow flowers with red tips. When these have had a chance to be pollinated, the covering leaves drop to the ground and a new set opens revealing another ring of sweet smelling golden blossoms. 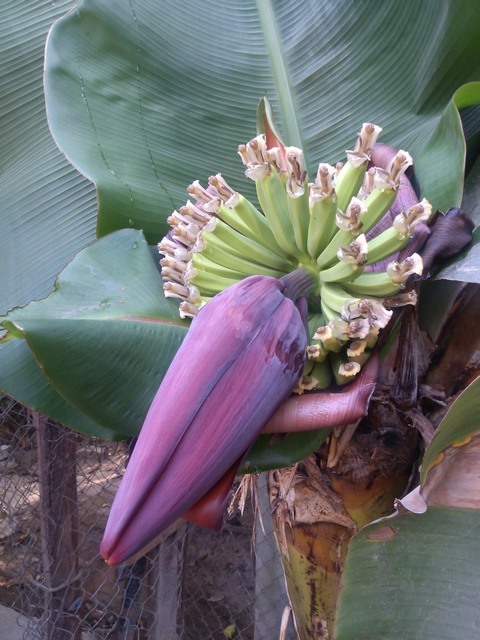 When the flower has opened completely, all that remains is a bunch of green bananas to grow and ripen – upside down of course. Then the plant sends out another flower and the process begins all over again. 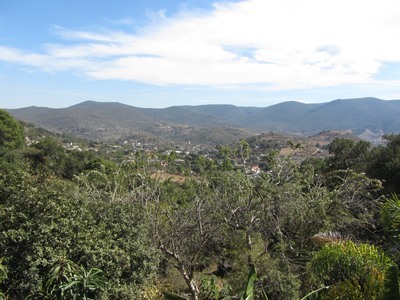 Here area a few more photos. Tasty beauty don’t you think? 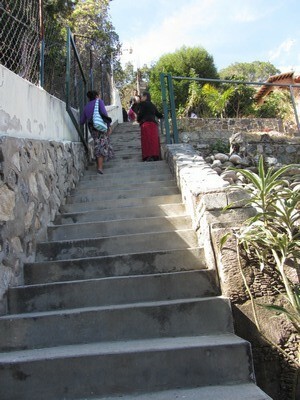 Below the house, by about 50 or so steps, is the Acamixla KH, which has a balcony that wraps around the side and back. 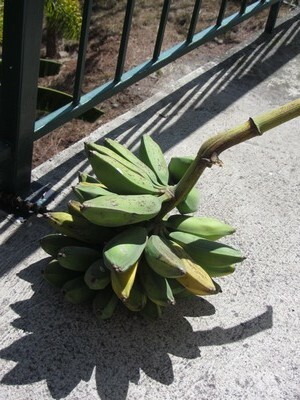 I was snapping some photos and admiring the view when I came around a corner and and there on the deck sat a big bunch of bananas ripening in the sun. 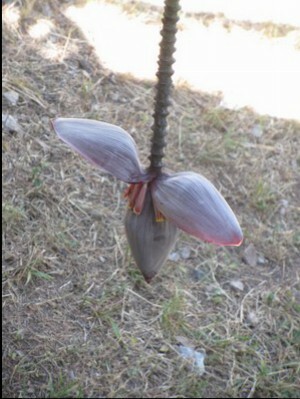 Looking around, I discovered the bananas must have come from one of several trees growing on the property..
Having only seen banana trees at botanical gardens, and then usually with a bunch of bananas high over head, I was amazed to see this “double-decker” banana flower up close. You can clearly see the bunch of bananas at the top but look closer at what appears to be a relative of Audrey II, the man eating plant in “Little Shop of Horrors”, and you will see a banana flower just starting to open. 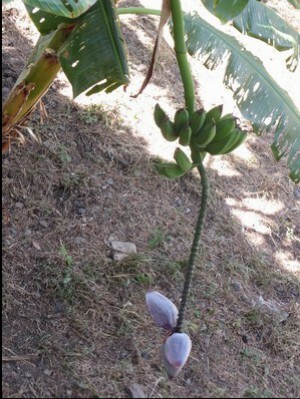 Look closer still and you will see the individual banana flowers under the larger open petal. As the larger flower bud opens, petal by petal, it exposes a ring of long, tubular yellow flowers with red tips. 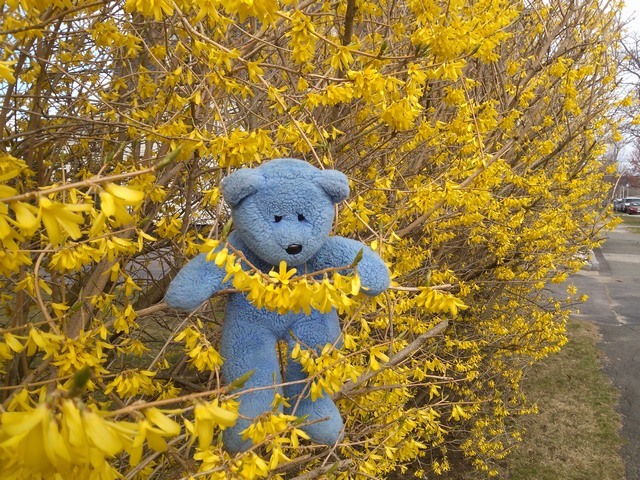 I am told that when these have had a chance to be pollinated, the covering leaves drop to the ground and a new set opens revealing another ring of sweet smelling golden blossoms. 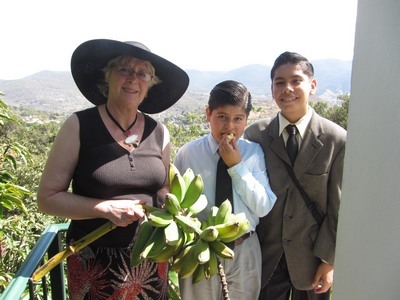 When the flower has opened completely, all that remains is a bunch of green bananas to grow and ripen – upside down of course. But you knew that didn’t you?